Concrete base work for the track will continue on Elm Street between 12th and Green streets. Rail installation will continue on Elm Street between 15th and Wade streets. Work will start on Elm between Wade and Green streets. Replacement of granite pavers will continue on Elm Street. Existing pavement removal will start on Elm Street near Green Street. Backfilling for the Maintenance & Operations Facility will continue at Henry and Race streets. Water main installation will continue on Walnut Street near 8th Street. Work will start on Main Street near 4th Street. Installation of conduit (tubing for electrical wires) for traffic signals will continue on Race Street near Findlay Street. Work will start on 2nd Street near Main Street. New sewer installation will continue on Race Street near 13th Street. Work will start on Race near 14th Street. Storm sewer work will continue at the Maintenance & Operations Facility; and on Race Street near Findlay Street. Duke Energy will be doing underground gas work on Main Street between 4th and 5th streets; and on Race Street near Green and Elder streets. Duke will also do underground electrical work on 12th Street near Vine and Race streets. Telecom work will take place on Elm Street near Green Street; on Race Street near Green and Liberty streets; on Race near 14th and 15th streets; and on Race near 12th Street. Exploratory digging for utilities will continue on Walnut Street between 6th and 9th streets. This entry was posted in City of Cincinnati, Infrastructure Improvements, Project Update, Revitalize and tagged Central Business District, Cincinnati, cincinnati bell, cincinnati water works, Construction, Downtown, duke energy, metropolitan sewer district, MOF, Over-the-Rhine, rail installation, sewer, Streetcar, utilities. Rail delivery and installation will continue on Elm Street, between 15th and Wade streets. Concrete base work for the track will continue on Elm Street, between 12th and Wade streets. Existing pavement removal will start on Elm Street, between Wade and Green streets. Backfilling for the Maintenance & Operations Facility will continue at Henry & Race streets. Storm sewer work will continue in the Maintenance & Operations Facility site; and on Race Street near Findlay Street. Replacement of granite pavers will continue on Elm Street, in front of Music Hall. The Elm Street entrance to Washington Park Garage will be open again. New sewer installation will continue on Elm Street, near Elder and Findlay streets; and on Race Street, between Central Parkway and 13th Street. 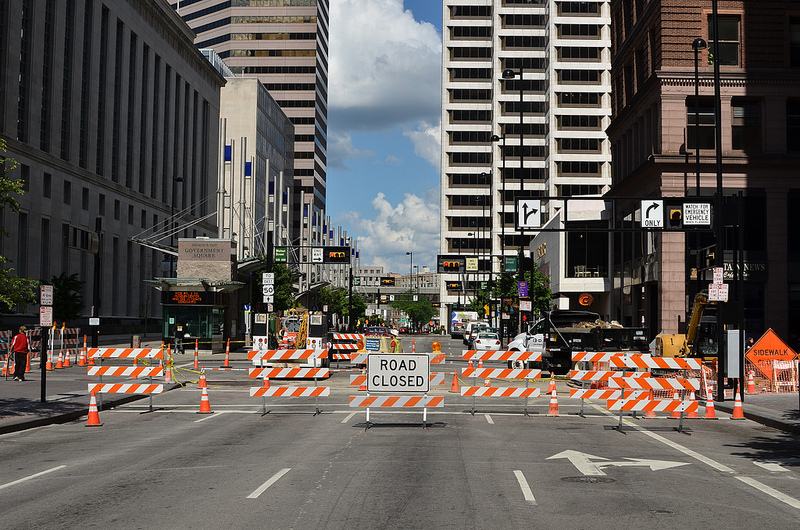 Sewer work will take place on Main Street and 8th Street in the Central Business District and on Henry Street and Race Street in Over-the-Rhine. Water main installation will continue on Walnut Street, between 9th Street and Central Parkway. Work will start further down Walnut, between 7th and 9th streets; and on Elm, near Elder and Findlay. Conduit installation for traffic signals (tubing for electrical wires) will resume on Race Street, near Elder and Green streets. Underground gas work will be performed by Duke Energy on Main Street near 4th Street; on Race Street near Findlay Street; and on Race Street, between Liberty and Green streets. Underground electrical work will also be conducted by Duke on 12th Street between Vine and Race streets. Telecomm work will occur on Elm Street, from Green to Wade streets; on Race Street, between 14th and 15th streets; on Race at Green; and on Race Street near Central Parkway. Exploratory digging for utilities will start on 2nd Street, between Main and Walnut streets.